The Title Virtual Host, Multiple Websites, Ubuntu 13.10 and Rackspace Cloud Server is not good but actually it explain the things we want to say. It is very common situation that, one has 2-3 serious busy websites; may be blogs or forums and other 17-18 domains which are rarely updated. The rest 17-18 do not deserve 17-18 1 GB server for each of them. To host multiple servers on Single Apache Webserver, we use Virtual Host, which is not really very difficult if you get used with. By now, we know How To Install WordPress on Ubuntu 13.10 on Rackspace Cloud Server and create image to spin up a new server with the existing setup with all the required softwares. We also know about Ubuntu 13.10, Apache 2.4.x and Apache virtual host has difference with Previous Ubuntu versions and Apache Versions. So, we know everything but just we need to arrange our knowledge a bit, so that we can actually server the websites properly. and restart Apache. There is, basically no big extra technological or coding knowhow except these few commands. It is not our work to understand, how example.com and example.org, being on the same server is rightly getting the folder. That is work of DNS, we need not to know so much; our only work is to properly set the path. Virtual Host can create initial trouble, search in StackExchange, SuperUser like websites to solve any issue. This Article Has Been Shared 2250 Times! 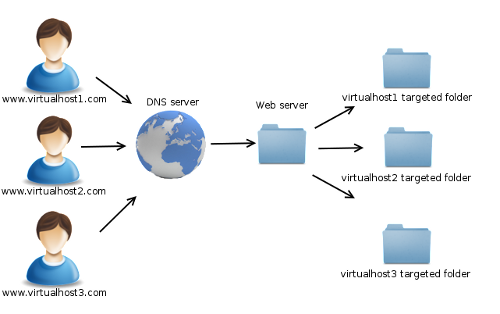 Cite this article as: Abhishek Ghosh, "Virtual Host : Multiple Websites, Ubuntu 13.10 and Rackspace Cloud Server," in The Customize Windows, March 30, 2014, April 26, 2019, https://thecustomizewindows.com/2014/03/virtual-host-multiple-websites-ubuntu-13-10-and-rackspace-cloud-server/.